Pediatric ENT Associates specializes in the diagnostic, medical and surgical care of head and neck diseases in infants and children. All of our members are Board-certified with current Alabama medical licenses and actively publish in peer review medical journals and participate as teachers, presenters and instructors both regionally and nationally. Pediatric ENT Associates (PENTA) in Birmingham specializes in the diagnostic, medical and surgical care of head and neck diseases in infants and children. All of our members are Board-certified with current Alabama medical licenses and actively publish in peer review medical journals and participate as teachers, presenters and instructors both regionally and nationally. Pediatric ENT Associates has five child ent specialists of Birmingham who have expertise in a range of children’s ear, nose, and throat concerns. 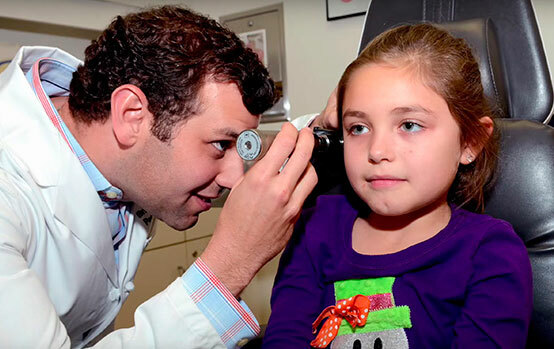 From hearing loss to obstructive sleep apnea, our physicians have the experience and expertise needed to accurately diagnose and come up with the best-individualized treatment plan for your child. In addition, the Pediatric ENT Associates physicians are active members in interdepartmental programs at Children’s of Alabama, providing a comprehensive and thorough approach to your child’s care. Learn more about our expert doctors. To learn about ear, nose, or throat conditions your child may be suffering from, simply click the interactive graphic below and you’ll be directed to the appropriate page. If you have further questions, please feel free to call us at any time or fill out a contact form. If you contact us after hours, we will get back to you as soon as we can. If you have any questions about pediatric otolaryngology or would like to schedule an appointment with our specialists, please don’t hesitate to call us at (205) 831-0101 in Birmingham, AL. Your child’s health is important to us, and we will always provide the best care possible.